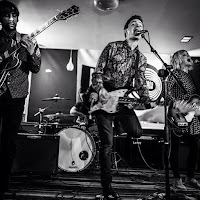 Catacombs is the second track on The Tapestry's recent Connectives single and they've just released a video for it that mostly recorded at their triumphant recent live sold-out show at The Deaf Institute in Manchester. The video captures all the thrills of a Tapestry live show, the buzzing interconnection between Liam, Katy, Dyna and Zara on stage and their audience. They have crowd surfers, Katy finishes the show spreadeagled on the middle of Zara's drumkit, whilst they still maintain that brilliant beatific rhythmic sound that has won them so many fans in Manchester and far beyond through their full on thrill a minute live shows. The Tapestry play Manchester Soup Kitchen tonight (April 28), Blackburn Confessional Festival (30), Mossley Music And Arts Festival (May 29), Manchester Gullivers (June 30), Blackthorn Music Festival (July 24), Scunthorpe Party In The Pines (August 2), London The Lexington Musicians Against Homelessness (October 2). Our review of the Deaf Institute show where the video was filmed can be found here.